There was an exciting event for foodies in Penarth recently: the opening of Pier 64, the latest venture from Francis Dupuy, formerly of Cardiff’s much-missed Le Gallois. With my own association with the Cardiff area being relatively recent, I’d never had the opportunity to dine at Le Gallois, but I’d heard great things – not least from Mr W, who was always a big fan. 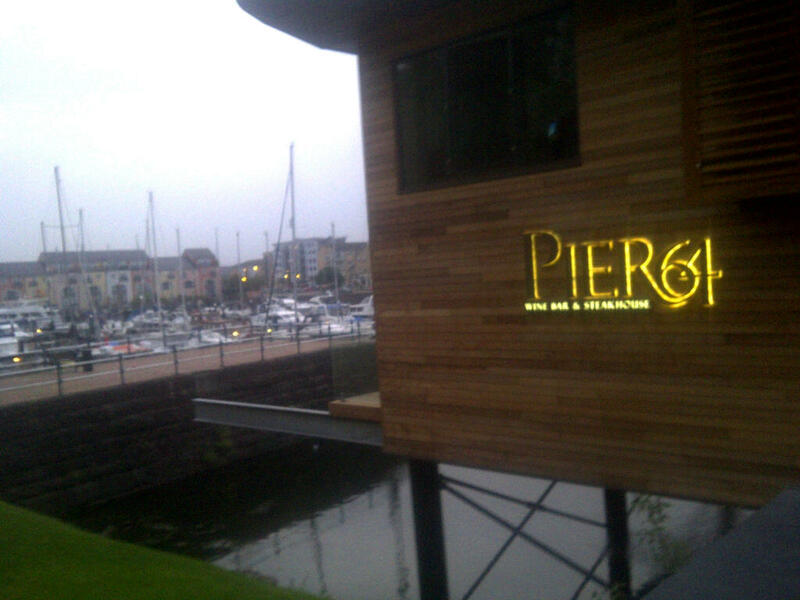 Pier 64 is located in the desirable Penarth Marina development, not far from The Custom House, home to La Marina and El Puerto. First impressions are that it is much more contemporary than the more traditional Custom House – although its billing as a ‘Steakhouse and Wine Bar’ could almost sound a bit 1980s if it wasn’t careful. Thankfully, the decor inside and out, is anything but – it’s modern, stylish and contemporary. It’s in a fantastic location with views of the boats in the marina outside and right the way across to Cardiff Bay and is certainly a pleasant place to be on a mild summer’s evening. We booked to eat at Pier 64 for the first time on Friday night, and were really looking forward to it. We planned to start off with a drink in the bar, but unfortunately our evening didn’t get off to a great start when we asked for a cocktail menu and were told they didn’t have any printed yet. This was odd on two counts – firstly, they’ve been open for around a month now, and this seems like a fairly fundamental thing to have organised, and secondly (and more importantly) I’d already seen a full cocktail menu on the website. It doesn’t take a genius to work out that they could just print a few off there as an interim measure if there really is a problem with the printing. Had I known, I’d have printed one off at home and brought it with me! As it was, the bartender showed me a very dog eared list that was obviously more of a ‘recipe’ list for their own use and didn’t have any prices on it. I didn’t feel comfortable studying it at length with her holding it, so opted for the first thing that caught my eye – something with fresh basil in it (having recently enjoyed the basil-based Bagheera on the QM2), which she went off to make, but after much crushing of ice and preparing of shakers, she eventually came back and said she’d just discovered the kitchen didn’t have any basil. By this point I was close to losing the will to live and opted for the trusty old Cosmopolitan instead – which was a shame, as it wasn’t one of the best I’ve had, and also having looked (again) at the cocktail menu on the website when we got home – just to be sure I hadn’t imagined it – there were some very appealing options on there. The bar area is laid out a bit strangely, with an ‘island’ in the centre, surrounded by bar stools, but separate from the serving bar. The island is a nice idea, but was very, very busy – mainly with people who all seemed to know each other (and most of whom seemed to know Mr W as well!) and didn’t seem the most inviting place to go and join in. There are a few tables along one wall, one of which we did manage to get, but there were a couple of groups/pairs of people standing around on the sidelines and it all just felt a bit odd. This, combined with a lack of music playing, made it feel a bit like we were in a holding area waiting to be ushered in to a function or event. It was fine for pre-dinner drinks, but it didn’t feel like somewhere I’d want to go just for a drink. The dining area is long and narrow and runs at right angles to the bar in a kind of a T shape. This means that all of the dining tables have nice views across the marina, but I’d already remarked to Mr W that I didn’t fancy any of the tables that adjoined the bar, as it had such an odd vibe to it. Fortunately, we were given a table a bit further along, near the kitchen. Now, Pier 64 describes itself as a Steakhouse, and it certainly does what it says on the tin. Other than the range of steaks, it has only about 4 other options – chicken, fish, lamb or vegetarian. It doesn’t look as if these are going to change regularly, so if you weren’t a big steak fan, you’d soon get a bit bored of the menu I can imagine. What it does have is a nice selection of salads, all of which are available in a starter or main course portion. Despite some other attractive although fairly staple starter options (smoked salmon, ham hock terrine, oysters, king prawns etc.) 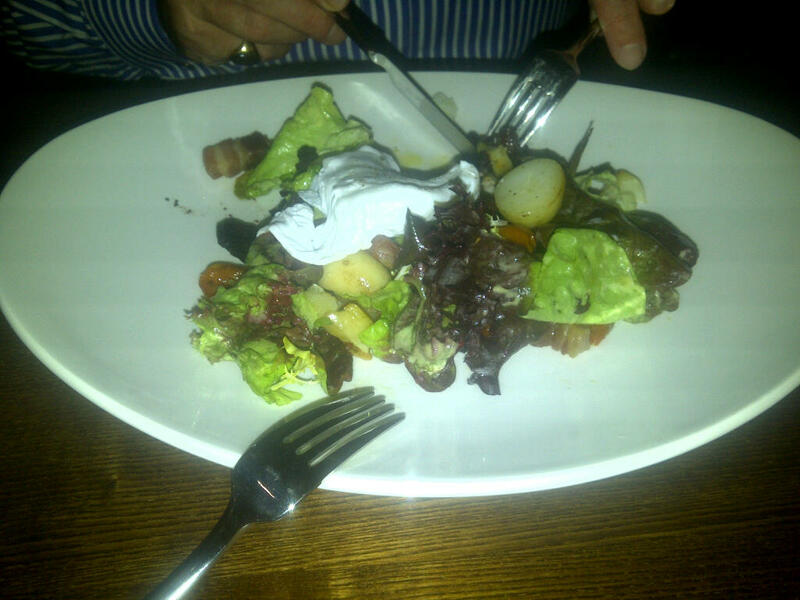 we decided to share a salad of black pudding, pancetta, soft poached egg and sunblush tomatoes. This was absolutely fantastic (as you can see from the fact I didn’t manage to get a photo of it intact before we dived in!) with the black pudding cooked perfectly and complemented very well by the crisp pancetta, warm poached egg and juicy tomatoes. A definite hit with us, and something I’d consider as a main course in future. Action shot of the salad! For our mains, there was nothing for it but to go for the steak. The list included all the usual cuts, plus a chateaubriand, which seems to come highly recommended – with a chalk board in the restaurant detailing the weights of chateaubriand that were still available. One of the best steakhouses I’ve been to is Gaucho, a London chain, which has a mind boggling array of different cuts of Argentinean beef, all of which will be showcased at your table by your server before the meal. I was really hoping for something like this, rather than just a full but traditional range of cuts, but sadly not. I chose a fillet steak, cooked rare, and Mr W had a ribeye, medium rare. The prices were not cheap, but probably on a par with what you’d expect for a decent steak. However, the photograph below, of admittedly one of the most perfectly formed fillet steaks I have ever seen, shows the full extent of what you get when you order a £23 fillet steak. No garnish, no tomato, no accompaniments. You can choose your accompaniments from a list – but you will pay an additional £3 for a potato or vegetable dish, and £2 for bread or a sauce. We decided to share three sides – sautéed potatoes, creamed spinach and grilled field mushrooms. These were all very nice, and came in serving dishes, but were definitely one person dishes, so there’s no defence for the lack of inclusion in the main course price on the basis that they’re designed to share. The steaks were both cooked very well (as opposed to ‘well done’!) and as requested, and we couldn’t complain about the quality of the meat or the cooking. I had a blue cheese sauce on the side, which again was lovely, but I did question whether it was really worth the extra £2. 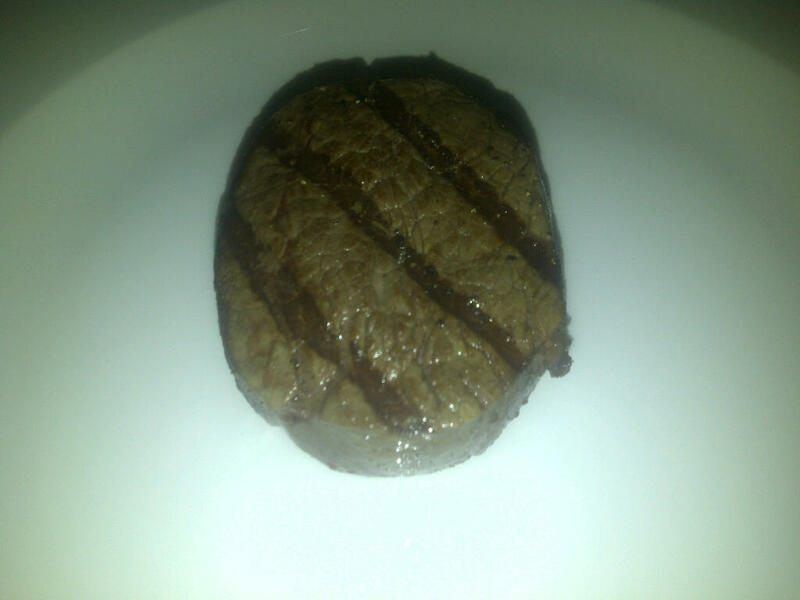 Perfectly formed, but very lonely fillet steak. Wine prices were similarly ‘exclusive’ – with some of the wines available by the glass going for a whopping £9 for a 250 ml measure. There were some cheaper bottles, but very few below £20. We calculated that for a couple, if you both had a starter (they ranged up to about £8), followed by a steak with a sauce and a couple of sides each, a decent bottle of wine and a dessert (£6 each), you could easily rack up a bill of around £150 without trying too hard. This is proper ‘special occasion’ stuff – which is great if a steak is what you want for a special occasion, but it doesn’t afford much choice if you’ve got a group of mixed tastes, or if your idea of a special treat is something with a bit more finesse. On the service front, Pier 64 seems to be experiencing the usual ‘teething problems’ – a few of the staff seemed a little confused by what was going on, and of course there was the cocktail situation! There also seem to be some licensing issues: Mr W attempted to have a brandy with his coffee, but as it was nearly midnight (we’d booked for 10 p.m. as this was the only time available) we were told the bar had closed at 11.30 and they couldn’t serve us any more alcohol – which seems a little unreasonable if you take a booking at 10 p.m. Similarly, he wanted to pop out onto the terrace, but this is apparently off limits after 9 p.m., which is very disappointing as it would be a lovely location to dine on a summer’s evening. We can only hope that after a few months of trading without any disruption to local residents (insider information revealed that local objections are the cause of the restriction on the terrace), the licence can be extended, as it would be a shame for them not to be able to capitalise on the location. To summarise, we had a lovely meal, and you couldn’t fault the quality of the food, but it is shockingly expensive for what is essentially a very simple concept. Steak is, after all, steak – and there’s a limit to how good it can be, with more than one place in the area being more than capable of getting it right, most of them at a lower price. Whether it’s the location, the loyal following that Francis brought with him from Le Gallois (where the cuisine was much more sophisticated and probably more justifiable at that cost) or something else that is driving the pricing structure, I really hope that once the initial ‘we must try that!’ buzz around Pier 64 wears off (it was packed when we went, and fully booked until late), the simplicity of the menu combined with the high prices doesn’t mean that trade drops off. We really liked the place, and would love to go back, especially once it’s settled down, found its level with longer-term clientele and got through the teething problems with the service – I just hope it’s still there! Recommended – if you’re not on a budget and are in the mood for steak! I can’t help you with the address and postcode as it doesn’t seem to be listed on the website unless I am being blind! ← The Queen Mary 2 dining experience – part 1! I know, it really was very odd. At that price, regardless of the price of the raw ingredients, you want some finesse around the presentation. They do say they offer ‘simple’ food, but that is taking it a bit too far! ‘insider information’ – hmmm – do you perhaps mean, ‘the restauranteur’?? If they want to build a new restaurant in an established residential area they have to accept certain restrictions. Once they have accepted them, they ought to live with it and stop moaning. ‘The restauranteur’ (sic)? No. All reviews are independent, as stated in my ‘About Me’, so I would not include a viewpoint from the restaurateur. ‘They ought to…stop moaning’: just to be clear, I wasn’t aware of anyone from the staff moaning, either on our visit or elsewhere. The only people moaning about the terrace being closed off were us – because we would have liked to have sat out there! Was there last week and the terrace now opens later! Thought you would like to know. They have had their lisence extended – shows theya re taking oppinions on board I suppose. Sides are still extra and the island is still a gathering place for groups of people who seem regulars and all know each other – they do sort of get in the way where you come in! That’s good news about the terrace! My Mum and Dad went the other week and said the sides were still extra – but you do at least get some tomatoes on the plate now, rather than just a lonely steak, but I still think charging extra for chips is a little ridiculous.